Geomatics Specialist & Field Botanist, CB Wetlands and Environmental Specialists inc. I have had a passion for the outdoors since I was a child, but it was my high school Geography teacher who inspired me to pursue a career in the environmental sector. While attending St Mary's University as an Environmental Science major I became involved in a habitat classification project using satellite imagery and consequently earned an honours in Geography. Wanting to learn more, I attended COGS where I received an Advanced Diploma in Remote Sensing. After graduation I accepted a position with a small environmental consulting firm in Halifax called CBWES Inc., and with the companies support I returned to St. Mary's University in 2010 to complete a Masters in Applied Science. Following graduation in 2012 I returned to my full time duties with CBWES Inc.
As a Geomatics Specialist and Field Botanist with CBWES Inc. 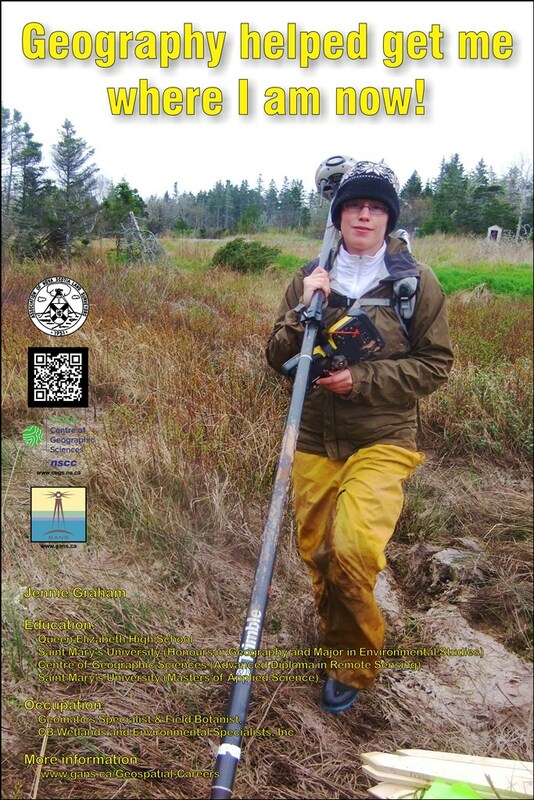 I have dedicated the past several years to wetland restoration in Nova Scotia. My work takes me outdoors for the part of the year to collect environmental data about plants, soil, water quality, fish and more. Field work often involves the use of survey grade RTK GPS and a low-altitude blimp the company uses to capture aerial photos. I also spend a portion of the year inside performing GIS based analysis such as elevation and hydrological modeling, habitat mapping and statistical analysis. With projects throughout the province I've been able to travel during the field season to work on different sites, and have also been privileged to participate in conferences both regionally and internationally. Although the company is small we often see a project through from the design phase to construction and then to several years of post-restoration monitoring which is carried out to ensure project success. I find it very satisfying to be a part of this process and to know that my work has contributed a tangible gain to environmental quality in Nova Scotia.